A UN aid convoy has reached about 50,000 civilians stranded on the Syria-Jordan border – bringing the first aid the camp has received since January. The convoy was meant to arrive at Rukban camp on 27 October, but was postponed for security reasons. Syria’s army controls access to Rukban, which is near a US-backed rebels’ base. Jordan is also blocking aid supplies. There have been reports of children dying due to poor sanitary conditions and a lack of healthcare at the camp. A cluster of about 10,800 makeshift tents and mud huts, the camp has been called “one of the most desperate places in Syria”. 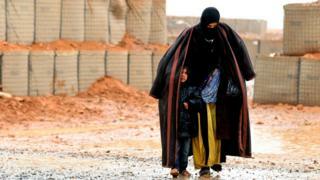 The UN estimates that 80% of the people stranded at Rukban are women and children, while aid groups say that pregnant women at the camp have given birth without basic medical care. The aid convoy, operated jointly by the UN and the Syrian Arab Red Crescent, arrived on Saturday. “Seventy-eight trucks are delivering 10,475 food parcels and flour bags, clothes for 18,000 children, 10,075 hygiene kits and plastic sheets, [and] newborn baby kits for 1,200 children,” the Syrian Arab Red Crescent said in a statement. The delivery is expected to take three to four days. “We are also conducting an emergency vaccination campaign to protect some 10,000 children against measles, polio and other deadly diseases,” UN humanitarian co-ordinator Ali Al-Za’tari said. Those at the camp began arriving in late 2015 after fleeing areas of Syria previously controlled by the militant Islamic State (IS) group. They wanted to cross into Jordan, which has taken in 670,000 Syrian refugees since the civil war began in 2011, but the kingdom sealed the crossing near Rukban in June 2016 after six soldiers were killed in a bomb attack claimed by IS. Jordan insisted the camp had to be supplied from Syria, but did allow occasional aid deliveries until January. Since then, residents have had to rely on what the UN has called a “trickle” of commercial deliveries. But even those dried up last month, when Syrian government forces reportedly blocked roads to the camp after the failure of a reconciliation deal with rebel groups in the area. Prices for food and basic supplies increased significantly.